Microsoft Ghana has finally launched Windows 10 in Ghana. Microsoft Ghana launched Windows 10 yesterday at the RS Amegashie Auditorium, University of Ghana Business School, Legon in Accra. The event saw Students from tertiary institutions around the country, Microsoft Student Partners Ghana members and the business community attending the event. Following the global launch of Windows10 in July, Microsoft has launched a series of Windows 10 promotions in Ghana to help students. Microsoft in Ghana has trained over 15,000 teachers, impacted over one million students and created over 1,800 jobs. Windows10 is in almost 95 languages. Windows 10 is our best Windows ever, taking the best of both Windows 7 and 8. Access to content is changing pretty fast. That is what Windows 10 is all about. One experience, one platform, one store! Our vision is to empower everybody to do and be better. Our objective is to help people do more and become more productive. In our work, office and home Windows 10 is one experience, one platform one store. All Windows 10 devices are using 1 platform. Windows 10 is the most secure platform and can protect people from Cyber criminality. We are working with partners to ensure you get windows devices at an affordable price. Microsoft Ghana is partnering with Techno Mobile to launch the best mobile device for work, the Techno WinPad10. Warren La Fleure Education Lead, spoke on Transforming Education in Ghana with Windows 10 and Office 365. Windows 10 leads us to a world of digital learning. Knowledge & Learning is changing and making access to information more purposeful through creative design. Also at the launch event there were Windows 10 demos by students of Ghana Technology university, University of Cape Coast, University of Ghana, Reagent University, Ghana Institute of Management and Public Administration, Ghana Institute of Journalism with UCC, University of Cape Coast winning the best demo presentation. There were free windows 10 upgrade booths available at the event to help people upgrade their devices to windows 10. 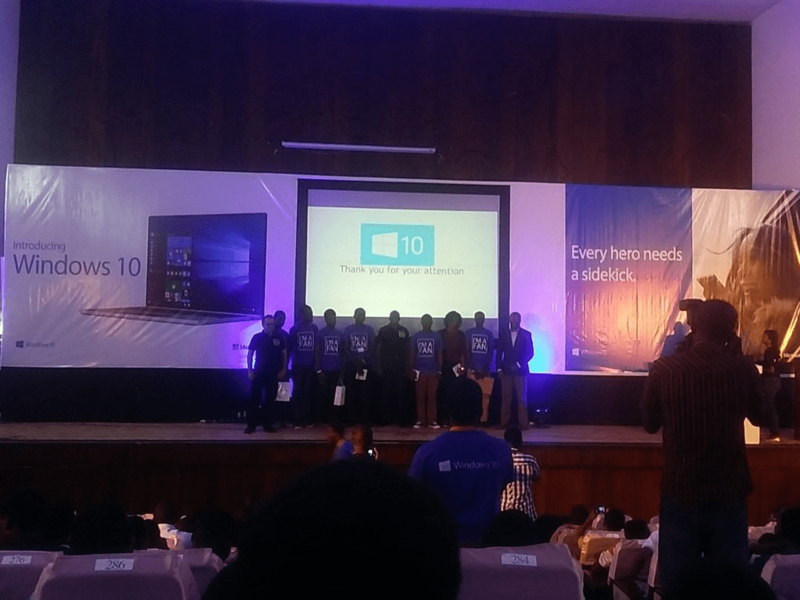 Were you at the at the #Windows10Gh launch event, share your experience with us. it is a good initiative but then the payment platform should have been set in all currencies instead of only dollars. Yes, if you mean to buy ?. Kindly send an email to support at microsoftcaregh . com on this and we’ll get back shortly. I wish to work with you. Any employment vacancy please?